This is a dish we used to serve at Po sometimes. The hallmark of Mario’s cooking is big assertive flavor, and chorizo definitely fits that bill. Chorizo is a cured Spanish sausage made with pork and lots of fragrant deep red Spanish paprika. Whenever you saute chorizo in oil, your oil will become tinted a wonderful red–a sign that the flavors of the chorizo are permeating your entire dish. The simplicity of this dish is remarkable. 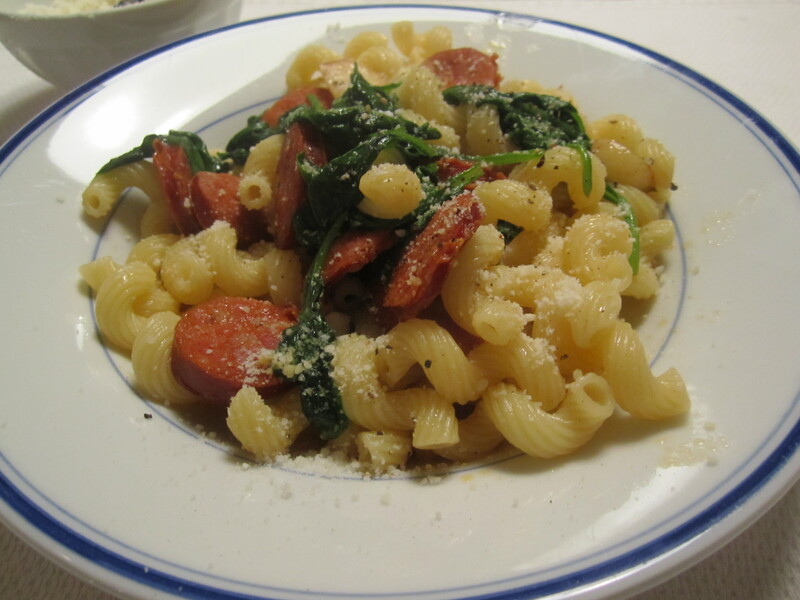 It consists of garlic, browned in olive oil with slices of chorizo. At the last moment, baby spinach leaves are added just before tossing in the cooked pasta. A touch of chicken broth is added to round out the flavor of the dish, and the dish is served with lots of pecorino romano sprinkled on top (parmiggiano is not assertive enough for this dish). You’ll be surprised at how the spinach helps the pasta diffuse the strong flavors and adds its own subtle green flavor to every mouthful. This is a dish that can cook in the amount of time it takes to boil the pasta. Drop pasta into boiling salted water. In a broad skillet, large enough to hold the pasta, slowly brown the sliced garlic for about 3 minutes. Add the chorizo and continue to slowly brown the garlic and render the sausage. When pasta is a minute shy of done, toss in the spinach leaves and stir into oil. Add chicken broth and pasta and a couple of tablespoons of pasta cooking liquid. Toss over high heat for 10 seconds or so. Top with plenty of grated pecorino at the table. there’s probably nothing that wouldn’t taste better with a little fried chorizo! Added mushrooms, cherry tomatoes, sundried tomatoes, and pine nuts; Amazing!